Presenter: Arabella Forge – Nutritionalist, Frugavore and Mum. Direction, Edit & Animation: Chris Grose (scoutfilms.com.au), DOP: Greg Blake, Camera Assist: Steph Boyle, Script: Tom Maclachlan, Additional Graphics & Life Support: Heidi Lee. Thanks to: Nick Ray, Arabella Forge, Cassie Duncan, Kate Anderson, Adrian Richardson, CERES Environment Park and The Marlowes. Music: Burgundy Reel by Father Sleep (Creative Commons license) and Pastel Slide (Apple music library). To you and me, good food is the basis for a healthy life. But we live in an era of convenience. And when we demand convenience, something happens to our food. Look at the tomato sitting on the shelf there. It looks fresh and healthy. But truth be told, that is one tired, worn-out little tomato. Because the system that rushes to get this guy to the shelf is, well, complicated. The great journey begins a long way away – before the tomato is even grown. Barrels and barrels of oil come from all over the world to help produce this tomato. The oil is needed for packing and shipping. And it’s also used to fertilise the soil. The tomato is then subjected to regular fungicide sprays while it grows. Tomatoes came up number 14 in the Top 20 foods with pesticide detection, FOE report (AUS), 2012 . See common chemicals used in tomato growing (US article). Then when it’s still green and crunchy, it’s picked from the plant, to prolong it’s life on the shelf. Later it will be sprayed with ethylene to make sure it goes red. The farmer knows this is not ideal, but he has no choice – he has a contract with the supermarket, and that puts him in a big rush. It’s not a great contract either. When that tomato is sold, the farmer will get as little as 14 cents to the dollar. The middlemen will get the rest. The tomato then gets thrown into a truck to travel vast distances. It then sits in cold storage, where it gradually loses some of its nutritional value. Finally, weeks after it has been picked, the tomato is put on display. Shiny, red … lifeless. In an era of convenience, a lot of people would argue that the supermarket is one of our greatest achievements. However, there’s a far more convenient way to feed ourselves and our families with real food. And all you need is a little bit of local knowledge. Local Harvest is a new website about good food that’s close to you. It’s a simple idea. You enter your postcode, and Local Harvest shows you where to find the best produce closest to you. It might be a local vegie box system, or a community garden, or a farmer’s market. Unlike the conventional tomato from the supermarket, this tomato was picked when it was ready to be picked. About 24 hours ago. The farmer that picked it got most of the profits. And it didn’t have to sit in cold storage for extended periods, because it came from a farm close by. So this tomato is locally grown, it’s fresh, full of nutrients and it keeps the profits local. In Australia we’re really lucky because we have good quality food close by. With every meal, we have the opportunity to support a different kind of food system – one that produces vibrant, healthy food with the wellbeing of people, animals and the land at heart. And that’s what Local Harvest is about. It’s not a gimmick or a diet and there are no prizes. We’re about reclaiming our food choices and narrowing the degrees of separation between our food and us. So, go to Local Harvest, type in your postcode and practice the art of eating locally, supporting local and organic farmers and businesses, and rediscover the life in your food. Because food is life, and every dollar we spend is a vote for the type of food system we want. >> May 27, 2012 The Sunday Age article – Canned: why local tomatoes cop a pasting. Tomatoes are the second highest value annual crop after potatoes. Tomatoes can be cultivated under cover in greenhouses or outside in orchards and can be consumed fresh, canned or used to produce sauces, juices, pastes or powder. The tomato industry in Australia can be separated into two distinct sectors, those grown for use in processed foods and those grown for the fresh market. Victoria is the major producer for the processed market accounting for 86% of total production followed by New South Wales at 12% and small amounts in the other states. Queensland on the other hand produces the majority of tomatoes for the fresh market accounting for 55% while Victoria, New South Walesand Western Australia produced 20%, 12% and 5% respectively. In 2005, less than 32 specialised processing tomato growers provided 99 % of the crop. Three factories process the bulk of the production. Two of these factories focus on tomato paste and derivative products and one specialises in peeled tomato products. d’VineRipe – in a joint-venture with Victor Smorgon Group and Perfection Freshhave a $30 million high-tech tomato glasshouse operation Spanning 17 hectares at Two Wells about 40km north of Adelaide in South Australia. Kagome Foods Australia – Japanese food manufacturer, Kagome, bought the processing plant in Echuca in 2010, previously owned by Cedenco (source). Now Australia’s largest tomato processor, with around 200,000 tonnes of tomatoes processed each year in Victoria’s Goulburn Valley. It grows and harvests its own tomatoes and supplies a number of major domestic and international companies. In Jan 2014, the Victorian Government announced it will contribute to Kagome’s $21 million expansion plans (source). 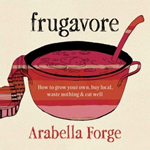 ‘Frugavore’ – ‘a love of all things frugal’ was coined by Arabella Forge in her quest to lead a healthier, less wasteful and more cost-saving existence. Arabella is a Melbourne-based nutritionist and dietician. She teaches cooking classes with an emphasis on traditional techniques at CERES Environmental Park and Organic Wholefoods in Melbourne. By living and cooking as a frugavore, you can learn to utilise the best quality foods, but waste nothing as you go. This means that money can be saved on groceries – not by buying cheaper produce, but by using better quality, local produce more wisely, and connecting directly to the source of our food and preparing items from scratch.